In recent years we have seen an exciting proliferation of remotely piloted aircraft systems (RPAS). Some refer to them as drones, others as UAVs and copters. What unifies them is that have all have properties of aircraft, allowing operators to fly over remote areas such as glaciers and farm fields, to fly in front of tower and bridge facades, and even to inspect inside buildings inside, for example with tiny copters. Since in most cases vendors and operators of RPAS want to optimize flight time, cameras and other sensors are rather light-weight. Combined with dynamic flight pattern of this super light-weight aircraft, creation of an image mosaic by photogrammetry was a demanding task. With products like Trimble UAS Master however this challenge is broadly solved, opening up a new and wide field for automated image analysis. By getting very close to objects, we can now see small damages on surface structures, we can measure and map facades and fields. 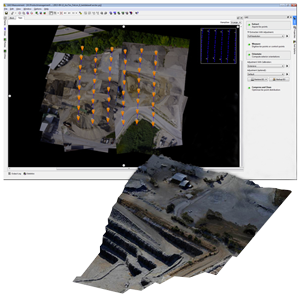 And on top of this we see an abundance of new opportunities for automated image analysis, turning tedious inspection and monitoring processes into predictable surveys. Have a look at one of our applications for identifying optimization potential for cultivated fields.